This RUST video series is brought to you by TinyPirate, who enjoys covering builder, survival, and sandbox based video games. He provides in-depth tutorials, guides, Let’s Play series, and all around fun times for all interested in watching his content. This time around, he’s worked on an updated, in-depth RUST Tutorial Series for 2019, broken apart into four digestible episodes. 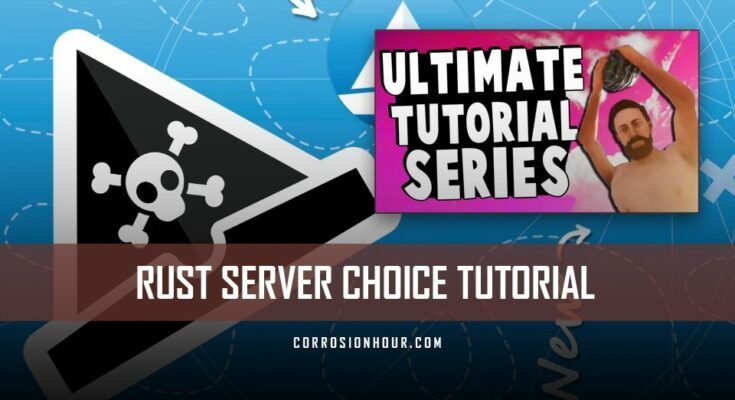 This post covers Server Choice, the first episode in a four-part RUST tutorial series. With that, you’re here to watch his video! Ah, Rust. The passion, the love affair. To call it a game would be underselling it. Rust is a lifestyle. Before we crack into all the Rust details, let me talk a bit about this video series. In this series of tutorials, I’m going to introduce you to Rust, and walk you through basic, intermediate, and some advanced concepts. Rust can be pretty complex. There’s a lot to learn. So you may need to watch these videos a couple of times before the details really sink in. It’s important that you understand who these videos are aimed at. I figure that if you’re watching this, you’re likely someone who isn’t running a big Rust clan. If you were, they would probably just teach you the game themselves. If you’re watching tutorials on YouTube, you’re probably someone who intends to play Rust solo, or with a small group of friends. Perhaps you’re the one who’s convinced them all to give the game a go. The reason I bring all of this up is because some of my advice won’t really apply to players who are running with large groups. For example, I’m going to recommend really conservative ways of playing, reducing risk for new players as much as possible. Anyone playing with a large team can be much more aggressive, and teams can take greater risks. So just keep all this in mind if you’re watching this video, and part of a big team, and find yourself disagreeing with my advice. The other important thing to mention is that Rust changes a lot. The developers put out content patches every month, and continue to add new features. Significant ones are added at least every three or four months. Because of this, there are likely to be things I mention in these tutorials that are no longer correct twelve months or more after publishing. To keep yourself up to date with changes, I recommend watching ShadowFrax’s Rust update videos. Greetings survivors and friends, ShadowFrax’s here. ShadowFrax does a great job of distilling what changes are being made each monthly update, and will get you up to speed quickly. Before we go leaping on a Rust server, it’s important to understand that Rust is at its heart, a PvP game. Yes, there is building and crafting, and there are some survival mechanics, but at its core, Rust is a big deathmatch experience taking place over the course of several days or weeks. Most of the time, you’re going to be outgunned and outmanned by players who are better than you and in teams that are bigger than you, with more resources and supplies than you. Most of the time people will shoot you before they will talk to you, and there are variety of reasons why this is actually usually the best play for the other player. So don’t get too bitter about it when it happens to you. When you do get around to playing, be pleasantly surprised if someone doesn’t kill you on sight. Before you play you should also know and understand that you can lose everything when you are killed. No inventory items are safe from the prying fingers of your murderers. Likewise, if enemies get inside your base, they can take everything they find without consequence. The very real risk that losing a fight could see you losing all your hard work is one of the great thrills of Rust, and it’s something you should be prepared for now. If you don’t really enjoy that kind of stress, then you should probably try to find some people to play with. If you don’t have any real life friends into Rust, then the Rust LFG group board on Reddit isn’t a bad place to go looking for some teammates. Spreading the risk out over a larger group gives you a much greater chance of success, and less cost when things go horribly wrong. There are also choices you can make when you choose a server, which will change or modify the level of risk that you’re dealing with when you’re playing. If you are someone who is very short on time, or someone who really, really isn’t that competitive, then one, I’m not quite sure why you’re watching a Rust tutorial or possibly bought the game, but don’t worry, we do have some servers for you that you can jump on. You’re going to have a fun time, even if you aren’t much into PvP. With these points in mind, it’s time to get on a server. With the Rust client open, click on the little play icon, and then don’t do a single jolly thing. The server you play on will make a massive difference to your game play experience, so let’s talk a bit about Rust servers. In essence, there are three kinds of servers. The first kind are the official servers, and these are the first on the list you see when you click on that play button, and they get sorted by pane. The official servers run the default game with no modifications and are typically quite busy. These servers are pretty anarchic with little sense of community, well in my experience. Potentially huge enemy groups to face, and usually less active administration to deal with troublesome players or hackers. I don’t recommend beginner players try and establish themselves on official servers, but they are fun to visit or fun for those who really like a challenge. The next type of server are unmodified community servers. And these are servers run by random individuals for the enjoyment of others. They don’t run any modifications to the game, but they often have particular rules or setting, and clicking on them will give you a clue as to what those are. I would typically advise new players to start on a community server, perhaps a solo or a solo duo trio server, as these are great places for single players or small teams to have a go without the threat of extinction at the hands of a huge horde. The third type of server are modded servers. Typically, modified servers are running accelerated resource and item drop mods, but there are also other kinds of mods with other play modes which are worth exploring. Mods are all server-side, so you don’t need to install anything to play on them. You can join a modded server just like any other server. If you want to know what the mods are, and they’re typically listed in the server information panel, then Google will tell you. In addition to accelerated drop servers, there are also modded servers which introduce unusual game mods, such as PvE server modes, where players can’t damage each other or each other’s stuff. Arena fighting servers for combat and weapons practice, and custom map servers, where you can find original and unusual maps that have been made by players. It’s important to point out a couple of things before we choose a server to play on. Most server information pages have web page links or discord links, or links to rules pages. It really pays to visit sever web pages so you can find out what the rules on the server are before you jump on them. If you don’t follow the rules, you can expect to be banned from servers and your work deleted without hesitation. The final point to note is that all servers regularly wipe, that is do a full reset of all buildings, items, and progress, and generate a new map. As a minimum, every server must wipe on the first Thursday of every month for patching by the Rust developers. This forced wipe coincides with new content and bug fixes, and frequently certain players trying out new features. In addition to the force wipe, many admins choose to wipe their servers more often than monthly. Typically, every week or two weeks. This keeps servers busy and prevents stagnation, as typically, after a few days, only a few groups of players are left on any server with other player groups destroyed, driven to greener pastures. Server information panels usually tell you when the last wipe was, and when the next wipe will be. And you can expect a big rush of players at the start of a wipe, as each group or individual tries to grab a foothold before the other groups get too powerful. In choosing a server to play on, it is important to keep in mind what stage or wipe the server might be in. If you’re joining just after a wipe, then expect a lot of players who don’t yet have much in the way of gear but are probably pretty viciously fighting for space. If you’re joining late in a wipe, expect a very quiet server with only a few groups remaining. Those that are still on the server are probably very heavily armed and looking to blow up anything they can find. So which server should you choose to start your Rust life on? If you’re joining a group, they probably have their own preferred server and you’ll be joining them. But if you’re on your own, or deciding for friends, I would recommend either a solo, duo, or trio server. Or if you’re in a group of four or more a low population cap server where you might find a little space and less pressure. By a low population cap, I’m talking maybe under a hundred players, or around that number. If you’re researching servers then you could check out the Rust server directory on Reddit. Server admins post information about the servers and the experience you can expect to find there, and other players comment on how they’ve found the server so far. This can be a good way to find out if the community around the server is likely to be one, you’re going to enjoy. Some people might recommend starting on a modded server. One of the most popular types of modded servers, as mentioned being the accelerated gather rate servers, commonly two, three, five or even ten times gather speed servers are quite popular. This can get people into the fighting quickly, and definitely is an option if you’re short on play time. However, just as you benefit from the accelerated gather rate, so does everyone else. So the play experience might now be any better. Another option I’ve yet to explore myself is playing on a primitive server. These are servers where the weapons are capped at sort of bows and crossbows and shotguns and not much beyond that. These can be a lot of fun if you’re into the more close and personal fighting. For the purpose of this tutorial, I’m going to assume that you stick to a community server without significant modifications. I should note that the filter tool on the Rust server browser gives you a great way of finding a server to match your needs. Just check in the words that interest you like solo, or perhaps ten times or primitive, and then just watch the filter do its job. For the final part of this little tutorial, I want to show you my own process for choosing a server. And I recommend you do something similar. So, I’m gonna go over to the play server. I’m gonna flip over to community straight away, and we’re gonna have to wait a little bit for the number of servers to stabilize, for it to fully refresh the list. So, I’m just gonna give it a second. Okay, so it’s still searching away but I’m pretty sure it’s giving me all the lowest pinged servers first. So, let’s just have a little browse. As a new player, I think you should be playing perhaps first of all on about a 50-size server. Or solo, duo, trio server, that’s an interesting option. It looks relatively professional. There’re rules telling me when the next wipe is. I can go visit their web page or find out about them. There’re not many people on it right now, so it could be a good option to start learning on. I would not recommend jumping on any no decay servers, or anything with any particular strange changes or modifications because you don’t really perhaps want to learn on a modded server. It might be good to learn best first on a vanilla server, so you understand what the default game is. Then you can learn changes through modifications and whatnot. I quite like the look of this server. 17 players isn’t too small, reasonably high population cap, but that’s okay. It was wiped on the 11th, which for me was about three or four days ago. It still has a few people playing, and it’s a solo server, so if you were brand new to Rust then you know everyone else out there is also on their own. At best, the fights should be one on one. Lots of good information and a web page to visit. This one looks like it’ll be a server that’ll be around for a while. Perhaps an option if you’re playing on your own. Also, down here I see a 50-population server with an active population right now of 13, and this is Australia prime time when I’m recording. And so Australia Gold Coast here is, I don’t know, that could be an interesting option as well. So this will give you a little insight into how I would choose a server if I was a brand new player. I recommend you do something similar for your very first server. You are more likely to have a fun experience if you choose the server that’s gonna match your skill and your ability to develop and learn, then if you join a server where everyone is a sweetie, how I call a PvP a little out for all the loops. A final point is you can use a little star next to the server name to make a server as a favorite. When it is a favorite, it appears in your favorites list. I find this very helpful if I want to keep an eye on things like particularly fun servers I enjoy playing on or build servers, or servers that I tend to come back to a lot. Well I hope this little tutorial has been helpful. I know it’s a little dry to start with a long introduction to the server environment, and the meta-Rust theory bits and bobs. But I do think it’s really important that new players understand how much their play experience is going to be modified by the servers they play on, and then making sure that players choose wisely. In the next tutorials I’ll be getting into actually playing the game, I’m sure you’ll be relieved to know. So I hope you’ll stick around for that. If you’ve enjoyed this video let me know in the comments below, share it around, become a channel member, or if you’re feeling very generous then why not add me as a supported creator in the Epic Store for those of you who use that. I’m there as TinyPirate, that’d be pretty amazing if anyone did that. Anyway, until next time, hope you join me in future tutorials.